Sending a Network Request indicates that you want that business to either provide you with a Quote to perform work (a Quote Request), or you want that business to perform the work (a Work Order Request). Network Requests can be sent to any e-mail address. First, open the job card which corresponds to the work you want to send to a subcontractor, then click the Network Request button. Note that the job needs to be saved at least once before you can create a Network Request for it -- so if you have just created the job, you may need to Save it first & then open it again. The Network Request window is displayed. It's very similar to the job card; this is because the Network Request will become a job in your contractor's ServiceM8 account. The details are pre-filled from the job card, but you can change any of the details or add extra notes before sending the request, without affecting the job card. The most important detail is the email address to which you send the Network Request. If the email address matches a ServiceM8 account which has joined the ServiceM8 Network, the request will arrive in their ServiceM8 Inbox ready to be converted to a job. Otherwise, ServiceM8 will send a link to the contractor's e-mail address, which allows them to view the job details and complete the job requirements through any modern web browser (Google Chrome, Firefox, Safari, etc). 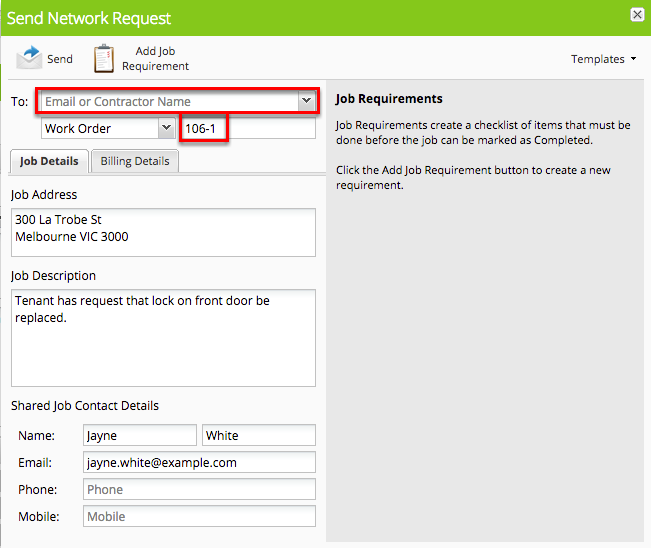 ServiceM8 will also auto-generate a reference number for the Network Request (106-1 in the example). This will become the PO Number of the job in your contractor's account when they accept the Network Request. You can change the auto-generated number if required, however it must be unique for each Network Request that you send. To Do requirements let you describe a task or procedure that the contractor must do. The contractor taps the requirement to mark it as complete. Document requirements are used to request that the contractor provide a document. Examples include an invoice for the work they've completed, or a copy of their insurance details. You can also mark document requirements as "Document has expiry date". If you select this option, then ServiceM8 will allow the contractor to re-use that same document for future Network Requests until its expiry date. This is useful for insurance certificates, licence details, and other documents that don't change between different jobs. Form requirements are very powerful - they let you temporarily share Forms from your ServiceM8 account with your contractors. You can use this for collecting job- or site-specific details, complex checklists, Work Health & Safety compliance documents, and much more. Any form that has a document template can be used. Shared forms will only be available to the contractor within the specific job that was created from your Network Request. 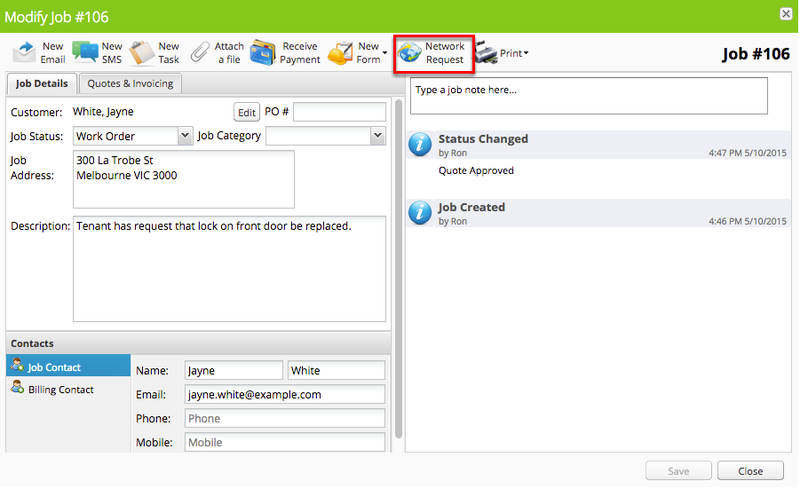 Once you're happy with the details and you've set up your job requirements, click the Send button to send your request. After the request is sent, it will be displayed in the job diary. The status will initially be Sent. It will change to In Progress after the contractor converts the request to a job. 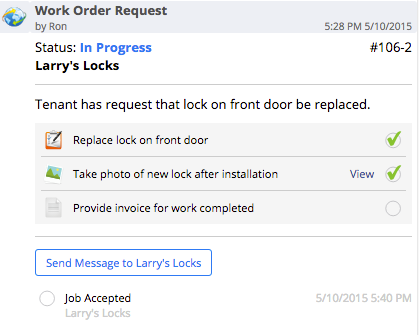 As the contractor completes each job requirement, a green check mark will be shown next to the requirement. 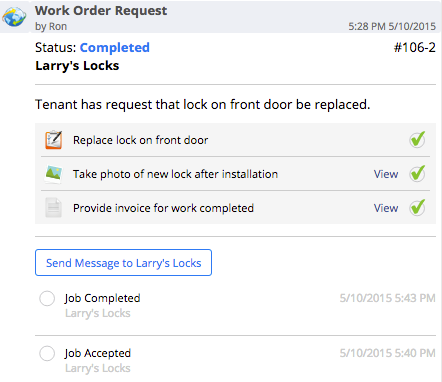 You can use the Send Message button to send extra information or questions to the contractor. A history of messages sent & received is shown underneath the Send Message button. After the contractor completes all the requirements and marks the request as complete, the status will change to Completed. If you find yourself creating the same job requirements over and over again, you should consider creating a Network Request template. These work in a very similar way to Job Templates - they let you quickly specify a standard set of details so you don't have to manually type them in every time. You can create Network Request Templates in Settings > Network Request Templates. To learn more about ServiceM8 Network, check out this video tutorial.